What I carry in my pockets. equipment and the sources for them. other pieces of equipment out there that are as good or better. their guidelines for your protection. A note on survival tools. brand new and from a reputable dealer. We have seen many "deals" on used drums. The big question is, what were these used for? clear tubing with a foot valve on one end. and has a male hose thread on the end to connect to a garden hose. not used for anything else. running it through a filter. 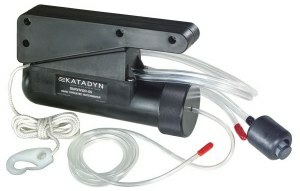 For fresh water filtering I like the Katadyn Pocket model. 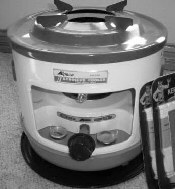 It uses a ceramic filter which can be cleaned and or replaced. These can be purchased directly from Katadyn or on eBay. Another one we like is the Triton M3 in-line filter. image coyright by Prismedical Corp.
may still be available throughon-line auctions. They will distill water much faster than a solar still. You need to follow the directions and keep watch on it. I know of would be to make one yourself. we purchased ours on eBay. the fresh water and all but a minute amount of salt is blocked. for the 35 runs about $ 1,950.00.
held in storage since the 1990's. Unused" - Don't fall for that line. even if they are kept unused and sealed. The most expensive part is the membrane. Here is what we did in 2009. 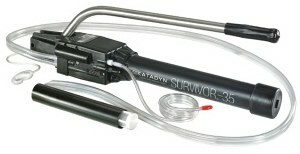 Then I purchased a Survivor 35 on eBay for about $ 195.00. I got a work order number from Katadyn and sent it in. around four weeks to turn it around. I then purchased a Survivor 06 on eBay for about $ 70.00.
five weeks to turn it around. We came out okay on both of these water makers. to sell, yup the youngest and oldest helped us move. We use these in a partially open area with plenty of ventilation. These are designed for outdoor use only. only use a heater that is designed for indoor use. safety features. 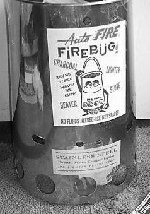 When heaters started coming into the U.S.
two major safety features were required to get a U.L. Listing. 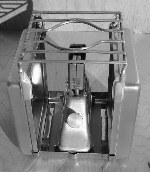 The second is a tip-over shut-off device. retract the wick and put out the flame. cases would slide a shutter over the wick - like the Kero Sun Radiant 8.
which say they are made in Japan, but they are not. my hands on do NOT have a tip-over safety device. allows the flame from the wick to add light to the room. from $ 50.00 for a fair one to $ 300.00 for one New In Box. The best time to buy a kerosene heater is in the summer. 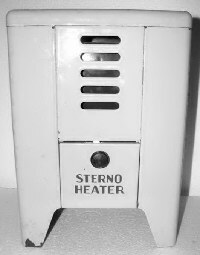 This is my favorite convection kerosene heater. The 1.7 gallon model has a good run time. light, and a little of the heat, in one direction. placed on the top of the heater, from sliding off. 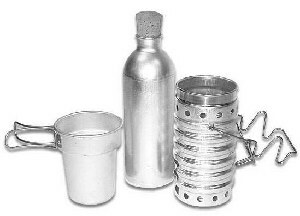 These are easy to carry around and to take outside for refueling. This is one of the nicest radiant heaters around. These can occasionally be found on eBay. 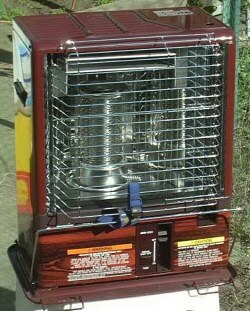 radiant heater which has a removeable tank. to better concentrate the heat onto a specific area. knowing who to ask is just as important. I saw a couple of these on eBay and they looked familiar. Sure enough, the heater is marked as being made in Japan by Corona. one can bring up to $ 275.00.
for $ 115.00 including shipping. more about kerosene heaters than I will ever know. Miles has some great information pages on his website. A note on purchasing heaters and stoves on eBay. That is the voice of experience speaking. For alcohol heating I would recommend the Origo Heat Pal 5000 series. one because of the low heat output. You will see these offered on eBay. Early ones used cotton wicks. 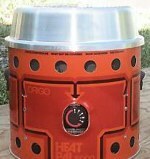 which use a removeable metal fuel tank like the Origo stoves use. uses a sliding shutter to control the heat output. Here is something that most people have never seen. It uses Sterno canned gel fuel. Some day I will actually try it out. matter as well as for use with fuel tabs. are basically designed for backpacking, others are not. These will be shown in order of ease of use and portability. 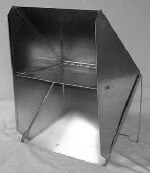 Stoves for use with fuel tablets or fuel bars. so you just stow supplies in it. 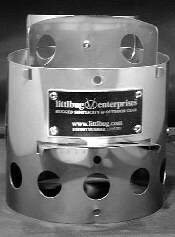 Littlebug Sr. and Littlebug jr.
a set of chains to hold a small alcohol stove at the desired height. It took a little over a week to get ours. a mild steel version called the Wild Wood I. $ 60.00 for the titanium model. 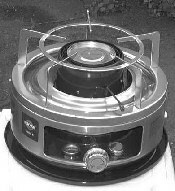 Four Dog Bushcooker LT 1, 2 or 3 titanium backpacking stove. intake and a cleaner combustion. 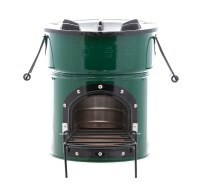 These stoves come in three sizes and are very well made. Being made from titanium, they are extremely lightweight. that was over three foot tall. ranged from pretty good to excellent. All of the Pyromids fold flat for storage and transportation. These items are no longer made but are sometimes found on eBay. in addition to the PyroPocket model. can be refueled without removing the cooking grill. 12" by 12" cooking surface. with an adjustable air vent. Everything folds flat into the base. 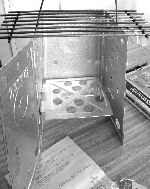 This is the PyroDuo stove. has a lip that the body fits into. 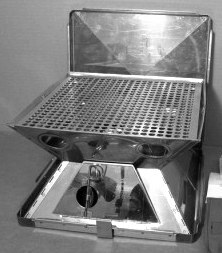 As can be seen, this has a grill and griddle top. 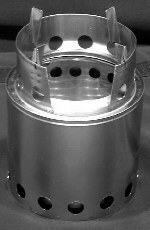 Pyromid model PCF -- 7 stove. A note on the pyromids. for solid fuel which appear to have been based on the Pyromid design. I have picked up a couple of these on eBay. 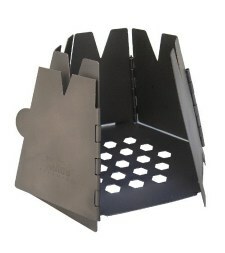 A wood/gas stove is more complicated than a simple backpacking stove. 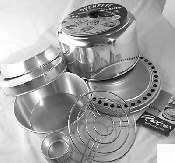 to use than a conventional hobo or trail type stove. These stoves need very dry fuel and must be protected from the wind. in your emergency equipment box. There are only two well made wood/gas stoves I would rely on. into the stove for storage. stove is a work of art. The bottom is enclosed for safety. 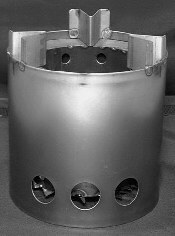 the fuel platform has angled slots for improved combustion. along with high corrosion resistance. At this time, 2/12/12, these models are no longer be made. If you can find one second hand, it is worth looking at. 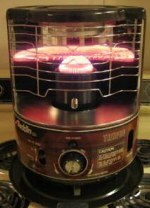 Four Dog no longer makes these DX stoves. These are very efficient and concentrate the heat on the cooking vessel. 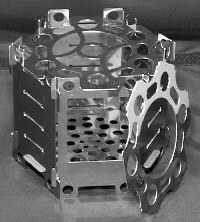 There are about a bazillion designs for rocket stoves on the internet. 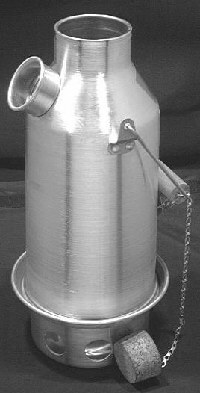 For a pre-made portable rocket stove we have a few recommendations. First off - Never, yes I said Never use one of these indoors. 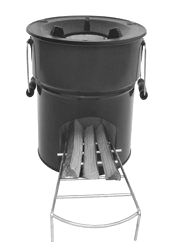 This is a Stovetec portable rocket stove. It is designed for burning wood only. 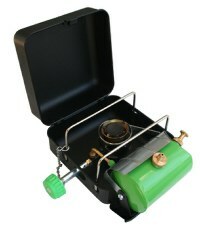 A very portable stove and easy to lug aroung. They also have a wood/charcoal model shown here. to control the air intake. insert that goes in the top door. the wood only model as it has less parts. that these would take a sharp blow. a metal liner to protect the insulation - a good decision on their part. 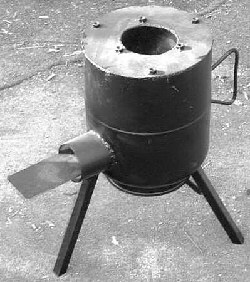 Another rocket stove I can suggest would be the Grover Rocket Stove. think it would take more abuse. 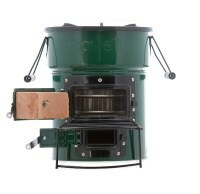 Grove currently offers their stoves with removeable legs. of wood. In a disaster, that might be all that is available. When you open it up, the fuel tab rest folds down. the storage of fuel tabs. The stove will also accept larger Trioxane solid fuel bars. eBay for around $ 20.00 to 25.00. in new condition. Image copyright by Cheaper Than Dirt. tabs but in a pinch you can use small pieces of wood or twigs. side near the bottom for loading fuel. These are nifty, lightweight and do not take up much room. Once again, these are made for outdoor use only. You can find these on eBay for twelve to twenty dollars. 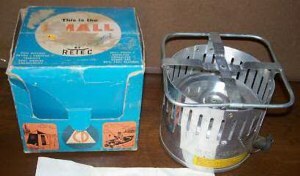 Camping and Backyard Stoves from the 50's and 60's. 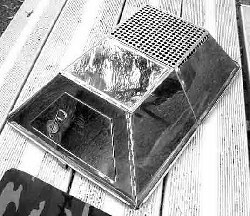 Some were offered as a combination charcoal lighter/cookstove. The quality ran from pretty good to it might last one time. Here are some pictures of stoves and stove-top ovens to peruse. used a canned gelled naptha fuel. well as in stainless steel. This one is stainless steel. stove top ovens were very popular. These are popular with campers. Tricky, but people make them work. use a small electric (muffin) fan to operate. a large fancy looking paper weight on your hands. Wood/gas stove which has an electric fan. alcohol as well as for use with transportation fuels. You can just about guarantee another disaster. of use and availability/cost of replacement wicks. for sale but the replacement wicks were in the $ 25.00 range. parts availability is not that great. There are two kerosene stoves I can recommend. They are extremely well made and thought out. Replacement wicks are readily available. $ 50.00 to $ 150.00. On a scale of one to ten, this is a ten in my book. 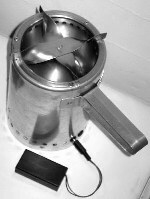 Alpaca kerosene cooker mod. 808.
alternative if you can not find a Kero-Sun mod. K stove. I would give these some thought before purchasing one. situation, complicated is not a good thing. cast iron, painted sheet steel and aluminum. 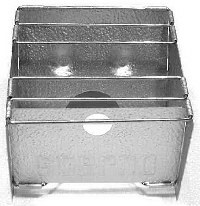 of aluminum and has a steel rack. 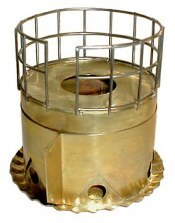 The first is the Trangia or Silva type stove design. You put alcohol in the center to fill the reservoir and light it. around the center and ignite. one of these which allows you to burn alcohol. rubber seal in the cap is good. stove is hot, the rubber seal will melt. forty to fifty dollars. We have a couple of second hand brass models. Pot supports and wind screens will run five to ten dollars. 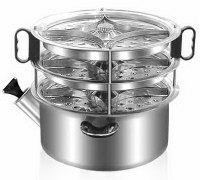 The second would be a Brasslite stove. large version of this stove (I & II). Origo mod. 1500 alcohol stove. mod. 1500. These are designed for use in boats. under the burner and is held in a synthetic filler. 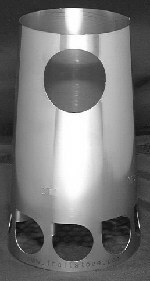 a shutter over the opening on the fuel tank. A couple of words of caution when purchasing these second hand. You will see a six pointed flame spreader in the center of the burner. 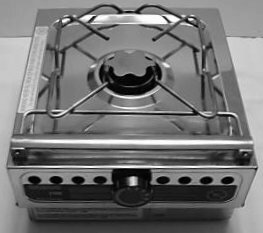 Often these stoves will be offered for sale with this missing. neither missing nor melted to the fuel tank. The stove needs to cool down before putting the rubber disk in place. 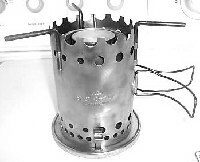 The following is a Retec 1950's emergency alcohol stove. butane, propane or a mix of the two. automotive gas, kerosene or diesel fuel could save the day. Each has its strong and weak points - we will not debate them here. The first would be the Primus OmniFuel. 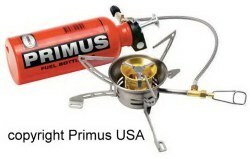 Another would be the Optimus Hiker + stove. And the Brunton Vapor AF stove. as well as on eBay. The Optimus Hiker + runs from $ 140.00 to $ 175.00. The Brunton Vapor AF runs from $ 125.00 to $ 180.00. Kettle, Ghillie Kettle and the Thermette. To state the obvious - these are for use Outdoors only. You load small pieces of wood or twigs in the fire base. 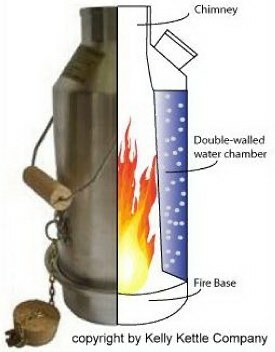 heat transfer from the fire to the water. Never fire one of these up without having water in it. There are a number of companies that make these. 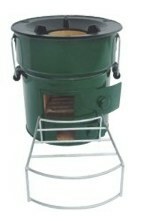 We have used a couple by Kelly Kettle, Ghillie Kettle and one by Thermette. a cap with a knob. a pan on top of the Kelly Kettle for cooking. These are also available on eBay. As far as I know, these are no longer made. and sometimes the whole match, is covered in a sealer. to the container they came in. stove, will probably not work. They are sometimes offered as lifeboat / survival matches. submersing them in water will not put them out. burn like a Fourth of July sparkler. These also need a separate striking strip. the ones on the right are even better. These can be found on eBay as well as on many websites. carrying them in some type of match container. You can even make one from plastic pvc pipe fittings. tightening the cap too tightly and jamming the threads. windproof matches are too long to fit in one. These sell for around three dollars on the web and eBay. the end is a striking surface for kitchen matches. They are made of anodized aluminum for durability. paracord to put through the cap for secure carrying and a spare o-ring. As I am writing this, there is one in my pocket filled with wind-proof matches. It keeps my firestarter, knife sharpener and pocket knife company. Catagory links on this page. 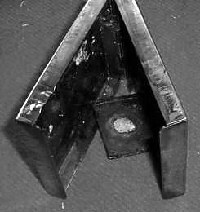 Above you will see several survival fire starting devices. get thousands of lights before they wear out. in the end. As clumsy as I am, I use a knife to work the fire starter. on what kind of scraping blade is in the cover. storing dry tinder and are very well made. I have seen them with and without a compass in the cap. They can be found on eBay from twenty-eight to thirty-four dollars. their design, some can be used as a signalling device at night. ferrocerrium rod with a scraper in the body opening. These are nifty and can be had from twelve to fifteen dollars on eBay. edge to throw sparks from the ferrocerium rod on the back of the block. This was the first type of fire starter I ever used. 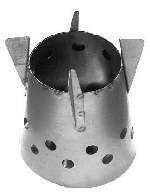 If you choose this type of fire starter I would recommend the Doan starter. There are many less than wonderful imported look-a-likes for sale. These Doans sell on eBay from seven to ten dollars. compartment for tinder in the housing. 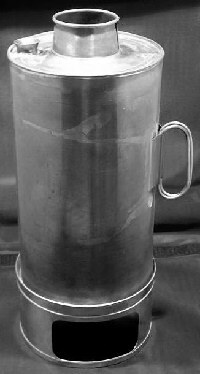 The scraper is mounted in the cap which is held in place by the cord. These can be had for fifteen to twenty dollars. shown, includes a hardened striker. have a titanium model, that's above my pay grade. There are many primitive methods of fire starting. The only one I have used is a fire piston. tools and/or matches as shown above. with a fire starting rod and/or matches of some type. Knives, Saws & Sharpening Tools. without a knife than go outside without any clothes on. anything else your imagination can come up with. Pictured below are a number of knives along with a folding pruning saw. The top knife is a "survival / tactical" knife with a "tanto" style blade. and with the sharp angle on the edge they are a drag to sharpen. and fairly easy to sharpen. and only succeed in making the knife look mean. in some instances a second blade with sawteeth can come in handy. 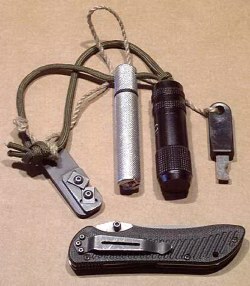 The top folding knife in the picture has a utility blade which locks open. The bottom knife is an old Swiss Army knife with a nice sawtooth blade. length, using it will wear you out. of them and for me, I prefer a high quality folding pruning saw. Gerber saws. The folding saw pictured above is made by Gerber. fire wood gathering, one of these can make the impossible, possible. often enough to see how durable the handle is. is a must for this tool. A note on knife blade steels. As for knife sharpeners, there are tons of them out there. sharpening surface as well as the old standby, Arkansas stones. I have used lots of them and these are my two favorites. a belt pouch and the sharpening rod stores in the handle. a fine job on the curved hook blade on a Woodman's Pal. It has replaceable carbide inserts like a machining tool. The standard model is about 3" long by 3/4" wide by 3/16"
keyring, but I will stick with the standard size for regular use. 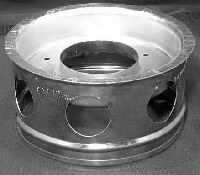 made of D2 tool steel which is a very hard die steel. 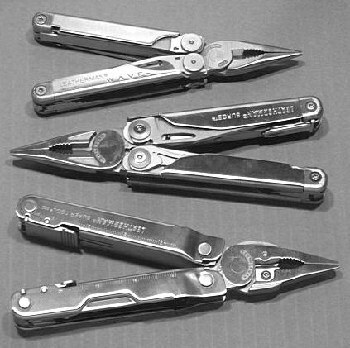 An item that might be handy to have around is a multi-tool. dedicated tool can do it better. file and many other things in between. These have some tools in common. quality of cutlery steel in the knife blade. for many reasons in an emergency. have a couple that we can easily recommend. The first is a little pricey but effective. This is the Pett Go Anywhere toilet system. the other holds the first bag for disposal. The toilet folds up like an equipment case. and gelling) bags for this toilet. the price of the Pett Go. might be an economical alternative. They use waste bags like the Pett Go. In April, 2011 we had to have our 1951 sewer line replaced. The Pett toilet sure came in handy. on a 5 gallon plastic paint bucket. There are very many variations on the theme. then snap the seat with a lid on top. These are not extremely stable but they do work. these too along with a roll of trash bags. toilet can be a disaster to use. 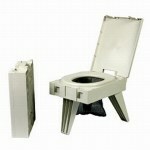 This can also be true with some of the "Porta-Potty"
type of flush toilets as the bowls are very shallow. 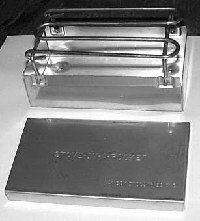 a plastic and metal paperweight. One that could run off of the sun or a built-in generator. What would I want to have on hand? from $ 75.00 to $ 125.00 on eBay. for thirty-five to forty dollars each. These do not have batteries which can go bad. generator to power the radio. the spring motor keeps running when the radio is turned off. will turn at a pretty good pace. A note on hand crank radios. 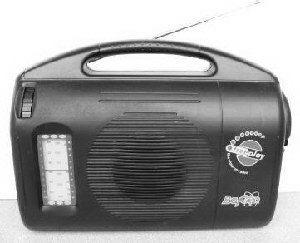 Most of the hand crank radios you see use batteries. The crank turns a generator that charges the batteries. fancy new ones with batteries. For shortwave as well as AM/FM I have a suggestion. and its quality, this radio takes eight "D" cells. That means it operates on 12 volts d.c., just like your car. or a 12 volt alternative energy system. from $ 100.00 to $ 200.00.
radios were the hot ticket. made portable emergency units for automobiles. base - all in a carry case. operating condition of one you are interested in purchasing. This is a Realistic emergency radio by Radio Shack. accessories, parts as well as good information. 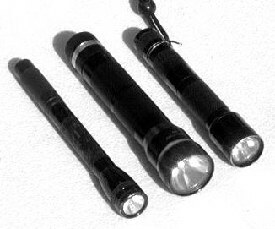 For flashlights I have some suggestions. The batteries are rated at a ten year storage life. 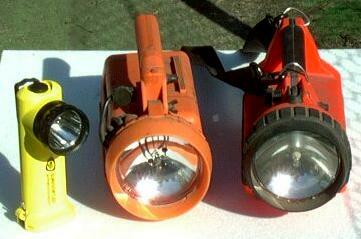 brittle from age) and a more current model Streamlight Litebox. 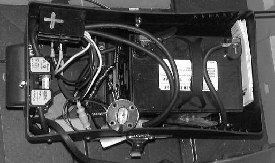 connectors and female lighter plug outlets. A Steamlight Survivor LED flashlight with a DC fast charger. the utility power for several weeks. The housings on the other lights finally gave out. 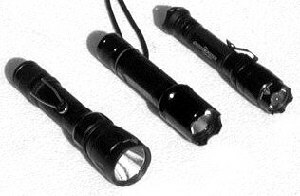 There are a number of 12 volt d.c. portable lights. The one we prefer is the Flexcharge Nite Stick. Kerosene is a safe liquid fuel when used and stored properly. lantern and an Aladdin incandescent mantle lamp. movies. They produce light from a burning wick in a glass globe. wicks and globes are easy to find. These are very durable and simple to use. They can be found on-line as well as on eBay. and globes for that particular lantern. and some water clear K-1 kerosene. direct most of the light downward are available for some models. durability and availability of spare parts. These are very durable and easy to lug around. they as efficient as a mantle lamp. great information and spare parts. the kerosene burns under a mantle. output can not be adjusted as much without smoking up the mantle. a glass font as well as with an aluminum font and shades. years - Christine really likes them. I bought my first Aladdin lamp in the late seventies. The mantle, once burned to ash for use, is extremely fragile. I can not recommend them for outdoor use. that all of our mantle lamps would be damaged. you take the time to look. propane lighting, I would choose kerosene. Most propane lights are made for outdoor use only. 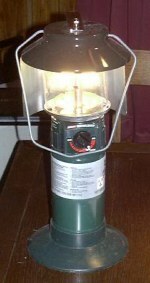 Here is a Coleman propane lantern with electronic ignition. 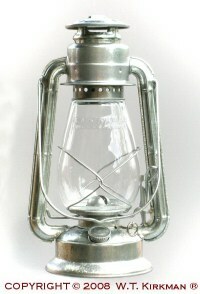 This is a dual-mantle lantern. For area illumination it is not really necessary. keep the bright light out of your eyes. the tank and screw in the lantern. 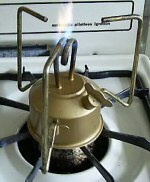 propane for a stove when used with an extension hose. When you are looking for a Prest-O-Lite post I have a couple of suggestions. mounting/support bracket, they just connected to the gas outlet on the tank. 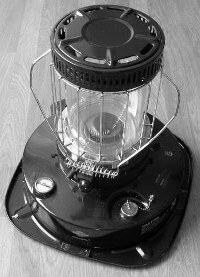 A suggestion when your are looking for a propane lantern. If possible, look for one that accepts Coleman # 21 string-tie mantles. These are the most commonally available style of mantles. funny as we are all used to street signs and landmarks. just been an earthquake or storm. How do you get home or where you need to be? 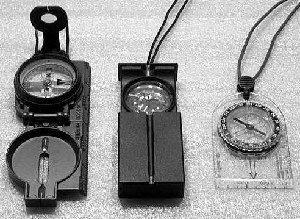 Here are a few compasses we have used. like the phosphorescent type. They last about ten years. A twenty-five plus year old Silva compass. sure you know how to use is. You might also get a topographical map of your area. natural structures such as rivers, hills and valleys. deal with night time breathing difficulties. and then to the medical device. have an independent source of electricity. 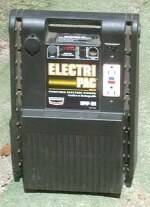 There are many portable 12 volt power packs available. You will see them with or without jumper cables, with lights, D.C. to A.C.
modified sine wave inverters or with a built-in air compressor. connections to recharge off of a vehicle. Some can be charged using a solar panel and an external charge controller. These don't store much power but can be a life-saver in an emergency. Most have an 18 to 20 amp hour sealed battery. The higher the battery capacity, the heavier the unit is. modified sine wave inverter and a single 12 volt d.c. lighter receptacle. It also has a row of LED's to show the state of charge of the batteries. This unit has two 18 amp hour batteries and is very heavy. Here is an example of one of the portable systems we have here. 38 amp hour AGM sealed battery. charge controller and a 10 watt Solarex photovoltaic module. female lighter receptacles and Anderson SB 50 amp connectors. A Flexcharge battery system monitor is inside the box. connections where the connections are inside the box. This system provides lighting via Light It Technologies 12 volt d.c.
compact fluorescent lights for the stock room. Another of our systems is a fixed in place 12 volt setup. It powers up fans for ventilation. two portable tool boxes with wheels and slide out handles. 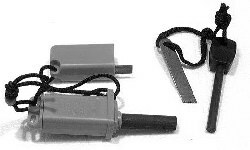 up portable lights, pumps and to provide a source of 12 volt d.c.
for radios and a small DC to AC inverter. or weeks, this should be planned for. cooling units available that run off of 12 volt d.c.
below the outside air temperature. A few, like vaccination coolers, will hold a specific interior temperature. These units draw from 3 to 4-1/2 amps per hour. usually have a lower amp draw than the larger units. I can not recommend a specific brand or model. It draws four amps per hour and keeps the interior at a set temperature. dedicated to running this cooler. A note on "survival" tools. hatchets, saws, multi-tools, shovels and like items. fair to the "don't waste your money" variety. in good shape and won't let me down? last for ages as well as be a tool you can depend on. never need sharpening or never rust. Or the blade steel is super hard for retaining the cutting edge. Let's cut through the smoke. All cutting edges will eventually become dull with use. Stainless steel will corrode, that is why it's called stainless. will not chip or break. things I have never seen. frigid cold temperatures, hurricanes and the like. But I have seen rolling power blackouts in very hot weather. The items in the above picture are always in my pockets. 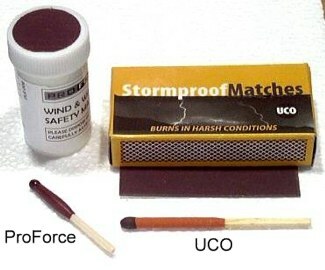 matches and a misch metal fire starter with a hardened scraper. Needless to say, I have not travelled by airplane in years.